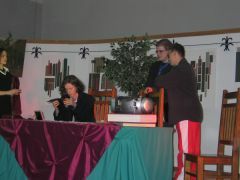 The English Theatre has been operating in our school since January 2003. It was founded by Eliza Wójtewicz-Brzozowska - a teacher of English. The aim of the theatre is to encourage students to read world-wide literature as well as motivate them to learn foreign languages in unconventional ways. 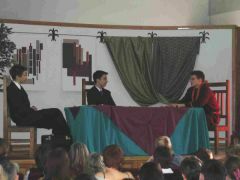 On 1st April 2003, at our school the premiere of the first performance in English "Romeo and Juliet" took place. 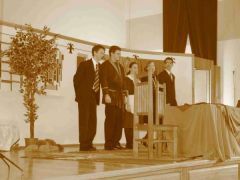 The performance was prepared by the students from grades IIIb, Ie and IVc and directed by Eliza Wójtewicz-Brzozowska in cooperation with the deputy head Renata Kutyło-Utzig, Elżbieta Ciesielska-Zając (doctor of philosophy) and Krzysztof Jończyk. The young actors: Agnieszka Alabrydzińska (Julia) and Tomasz Bąk (Romeo) gave an outstanding performance and showed great theatrical skills. 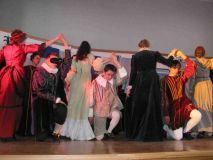 It was a great experience for both young actors and the audience. On 8 February 2005, the premiere of two one - act plays: The Professor and A Bad Dream by Donn Byrne took place. 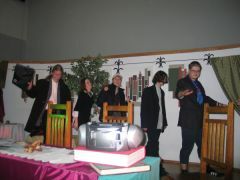 The Professor was prepared by students from grades II b and III e coached by English teacher Eliza Wójtewicz - Brzozowska and directed by students Natalia Szawaryn and Sylwia Riabczyk. The play tells a story of a famous professor whose invention was stolen by two crooks. The investigation is carried out by James Bond. The leading parts were played by Bartosz Maciejewski as professor Hunter and Natalia Krępicka - his secretary Mrs. Green. Both actors were absolutely stunning and gave a great performance. Wojciech Klicki as inspector James Bond played in a very convincing way and Łukasz Nowysz together with Grzegorz Paćkowski who played the role of crooks and thieves made the audience laugh. Magda Trzcińska in the role of professor&apos;s daughter-Mary showed equally fantastic theatrical skills. 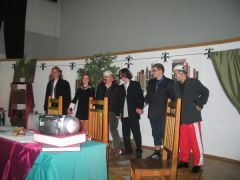 The students from I i and I h together with their English teacher Paula Zuchniewicz were responsible for preparing A Bad Dream. There were two casts performing consecutively: Mr Hill, a cold-hearted bank director who experiences a spectacular change of character, was performed by Paweł Lipiński and Maciej Przepałkowski. The decision of firing his devoted servant Annie - Natalia Pawelec and Agata Sadowska - is revised after Mr Hill&apos;s two encounters during his sleep. First, he is surprised by a visit of his two employees who want him to resign from his job. Briggs (Piotr Piotrowski and Bartłomiej Sieklucki) and Winter (Piotr Jabłoński and Michał Perka) are the voice of conscience pointing out Hill&apos;s faults as a director. Forced to quit, Mr Hill learns that his wife (Agata Walczak and Joanna Dziwota) is leaving him, too. Fortunately, it all is only a bad dream skilfully performed by both casts. All the actors deserve highest praise for their engagement and enthusiasm. Together with the director of the play Agnieszka Kelman and Izabela Wojda and Grzegorz Pągowski responsible for scenography and music, the first grade students gave an unforgettable show.